Shibuya 109 Men’s is one of the newest fashion boutiques for menswear. I went inside, but since I was unsure about taking photos inside the store, I decided not to. But there is no store that I have been to in the US like 109 Men’s. Shibuya’s fashion stores definitely are known for being on the expensive side, and this one was no different. The variety of styles was just amazing though. As many shops in Tokyo are, the store goes up I do not keep up with the fashion industry, but personal fashion is an interest of mine, and I knew one thing I’d like about Japan and Tokyo specifically over the US was how trendy and stylish a lot of people dress. Hundreds of people cross each cycle at the famous scramble crossing. Traffic is stopped in every direction, so pedestrians can cross the intersection in any direction. 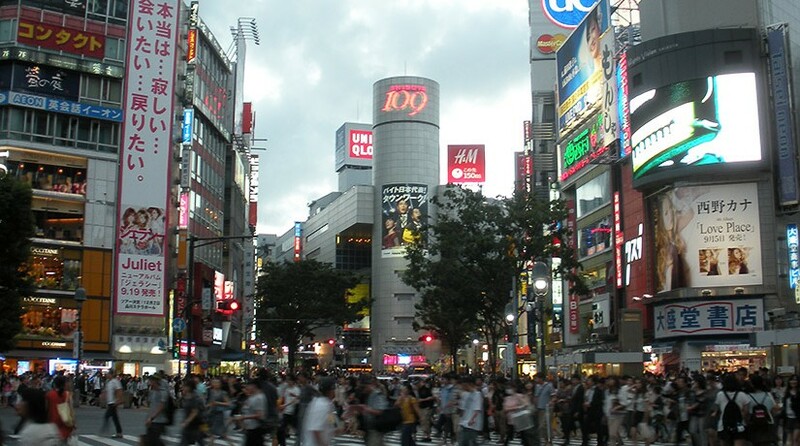 Tokyu Corporation owns many of the department stores in Tokyo, including Shibuya 109 and 109Men’s. Center Gai is a crowded pedestrian area in the heart of Shibuya. Along the streets there are many shops, restaurants, and game centers. And at night, it is a popular destination home to many bars and clubs. This arcade, Game Shibuya Kaikan was one of the first places I went while wandering Center Gai. Most games cost ¥100 with some only being ¥50. The basement had all retro games. I was looking for a specific game called The Tower of Druaga after hearing about it on a Japanese game podcast, but they didn’t have it. The upper floors had more modern games, with each floor having different kinds of games. One game I had wanted to play and never seen in an arcade in America was Beatmania IIDX, and this arcade did have a couple machines of that. I also played a few games of Street Fighter III: 3rd Strike and Super Street Fighter IV: Arcade Edition on the top floor. A few of the games were versus other Japanese players, and while I think I’m an average fighting game player, they usually won. Center Gai is filled with tons of shops and side streets. I only went into a few of them to look around, like Book Off, a used books/games/movies/CDs store. There are also some pretty unique places in Shibuya that you won’t find many of outside of Japan. The first is a butler cafe, analogous to Akihabara’s maid cafes. It’s also not hard to find an Internet cafe. These are especially useful if you are just visiting, since there is no public wifi in Japan. Of course there are Internet cafes in the U.S. and elsewhere, but they are more than just places to check your email in Japan and other parts of Asia. This particular place, Manboo, is a manga (comic) cafe. You have to sign up for a members card, and you pay by the hour. Once inside, you are free to read as much manga as you like, along with use of a computer. They also even offer showers inside. Some of these cafes have private rooms large enough to lie down in and stay the night. I have many more photos from Shibuya to share. Since there are so many, and there is so much to see in Shibuya, I decided to focus this post on the Center Gai area. My next posts will have other shopping places in Shibuya, as well as photos of Shibuya at night. Thank you for reading, and please leave a comment! If you like to know where to find upcoming events and things to do while on the go you should check out etrigg.